Below Deck Med’s chief stew Hannah Ferrier has launched her new activewear collaboration. Before the latest episode of the Bravo reality show aired this week, Ferrier told fans to keep an eye on her Instagram feed for details about the launch, plus she offered giveaways and a special deal of 20 percent off. As The Daily Dish reports, the Below Deck Med crew has to run around a lot, and Ferrier has to stay fit as the boat’s chief stewardess. Now, she is mixing her love of fitness with her passion for fashion. Earlier this summer, Ferrier teased a collaboration with Stay Fit Apparel and told fans to stay tuned. Then in July, the Australian posted a pic of herself at a harbor in her hometown of Sydney, and she was wearing a black bra top and spandex pants. In the photo’s caption, she wrote that she was “very excited” to show her fans the activewear line that she had been working on. As for her personal life, it doesn’t look like Ferrier and Conrad Empson are still together. In an episode that aired late last month, the chief stewardess and bosun got in a fight, and the couple wasn’t able to patch things up. However, it looks like she has quickly moved on, and may have herself a new boyfriend. According to Bustle, Ferrier is dating fellow Australian and basketball player Isaac Humphries. Earlier this month, she posted a pic of herself and Humphries in New York at Watch What Happens Live with Andy Cohen. In the caption, she thanked Humphries for holding her hand during a crazy work week in NYC and added three heart emojis. And, when Ferrier met Chrissy Teigen and John Legend at Nobu Malibu last month, Humphries was there with her. In an interview, she recalled the Nobu experience and explained that her “friend” picked her up late, and he is a basketball player who is 7 foot 1. She then revealed that being late to the restaurant was how she got to meet Teigen and Legend because as they were dropping the car off at the valet, the celebrity couple was coming out of a private exit. Ferrier says they had “about five seconds” to run into each other. Thanks for coming to hold my hand through a crazy work week in NYC boo @isaachumphries7 ??? We think the friend Ferrier was referring to is Humphries, who used to play basketball for the University of Kentucky, and then signed with the Sydney Kings before playing in the Basketball League of Serbia for FMP. The two have not made their relationship official, but if their social media exchanges are any indication, they appear to be more than just friends. 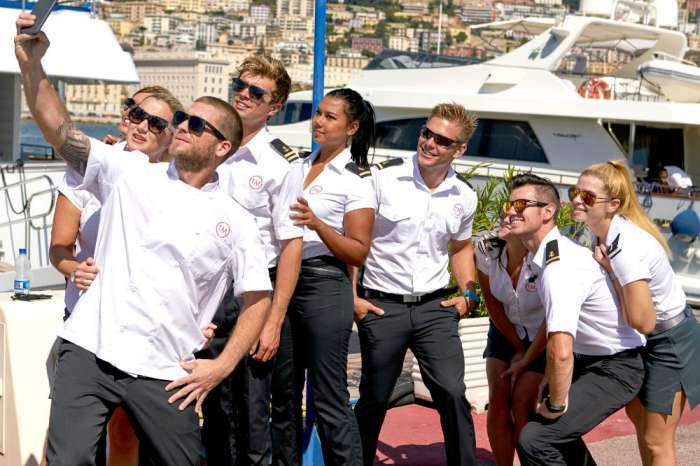 New episodes of Below Deck Med air Tuesday nights on Bravo. KUWK: Kylie Jenner Reportedly More Mad At Nicki Minaj Over The Travis Scott 'Petty' Attacks Than Him!